The sweet aesthetic of Whimsical Floral style brings pastel colors and pretty hand-drawn flowers and leaves together to accentuate the main text. All lettering is in a hand-drawn style. The main text is a whimsical, thin-lined curly script in bright color and is accompanied by a bold serif font in soft colors, with an ultra condensed sans serif for the supporting text. A subtle background texture that looks like a combination of stone and rumpled paper, brings this style together into a charming and sweet expression of who you are. 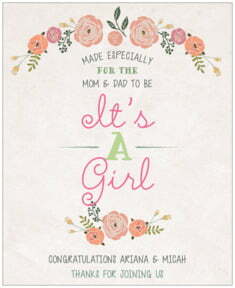 Customize your Whimsical Floral baby shower labels today to match your baby shower theme. 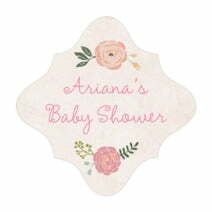 Whimsical Floral baby shower labels are printed on your choice of coated paper or waterproof vinyl label stock. The light colors are soft and gentle while the bright colored styles are luscious and juicy. In the case of the vinyl option, the labels are a little bit stretchy which makes them easy to apply to irregularly shaped containers. The vinyl stickers are also easy to remove, and the square shapes are even re-usable if they are on a smooth surface like glass or metal. Just peel them off by starting at a corner and pull the label back slowly. Then save them for another time by putting them back on their carrier sheet. Baby shower labels come in many different shapes and sizes for their many different uses (including bottled water labels and a label shape devoted to text for your mommy to be's special story). 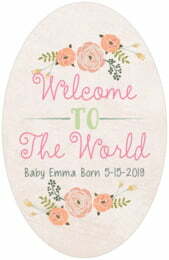 To get started, select one of the many shapes and colors and then click on "Personalize" to customize your Whimsical Floral baby shower labels!